RealtyTech, a national Real Estate software and marketing corporation, just launched their new redesigned website loaded with their new products and services lines for Agents, Brokers and Companies. The site is mobile responsive and features the newest in intuitive user friendly interface. 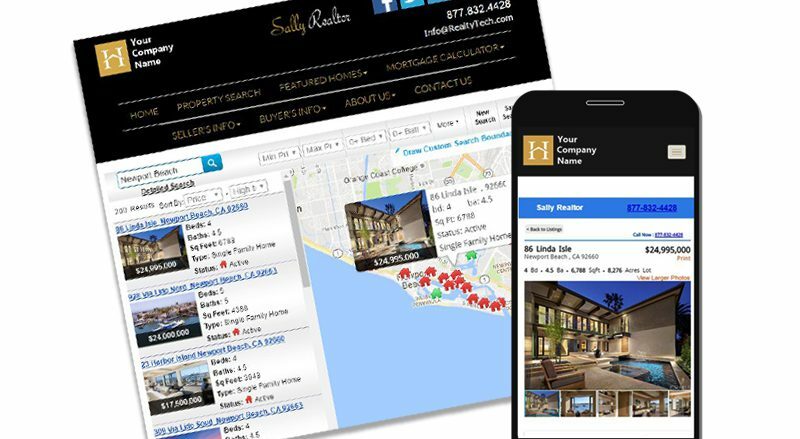 The modern design of the website is created so real estate professionals can easily navigate and find all the valuable information they are looking for, while showcasing the RealtyTech Inc’s new direction in visual design for Agent products such as websites and IDX MLS real estate search systems. The ample amount of visual content also helps agents and brokers to better understand all the packages offered by RealtyTech from design and branding to online advertising and marketing. “I’ve never been happier with a new corporate website than I am today. Our new site helps to project our image, professionalism and national reach, said RealtyTech Inc. CEO Richard Uzelac. “As we expand out of California to Florida and other states with our best in industry IDX real estate search system and lead generating website programs, we wanted to herald this with a beautiful online showcase or our expertise. The new website clearly demonstrates our strengths in an industry we have dominated in California since 2002,”Mr. Uzelac added. “Our products have always been a bit upscale, catering to the more experienced and professional agents and brokers. We plan on using our new website to take that message to the rest of the country and beyond,” said Mr. Uzelac. The new site utilizes live chat boxes that instantly connect agents to RealtyTech employees who will answer any questions or concerns. The chat feature will help to ensure client satisfaction and enhance user experience.